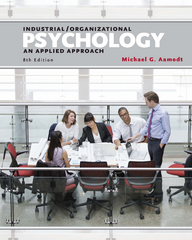 Industrial/Organizational Psychology 8 Edition Striking a balance between research, theory, and application, the eighth edition of INDUSTRIAL/ORGANIZATIONAL PSYCHOLOGY: AN APPLIED APPROACH helps readers discover the relevance of industrial/organizational psychology in everyday life through practical application. Readers analyze topics such as resume writing, interview survival, job description authoring, performance appraisal, employment law, job satisfaction, work motivation, and leadership. Humor, case studies, real-world examples, and a friendly writing style make the book both readable and interesting. Numerous charts, tables, flowcharts, and exercises help readers conceptualize complex issues.